The new year is the perfect opportunity to give your home a fresh look. 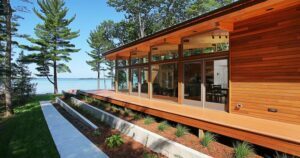 Check out the home design trends experts predict will gain popularity in 2019 and help increase the value of your lake home! 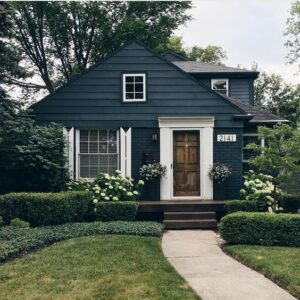 In 2019, expect to see more dark home exteriors in combinations of navy, steel grays and flat, deep reds, accented with contrasting colors like white door frames and/or natural wood shutters. In choosing paint or material colors to work with, consider the personality you want your home’s appearance to communicate. Dark blues are often associated with integrity and power, while dark reds communicate vigor and leadership. Charcoals and steel-gray tones often represent sophistication and masculinity. 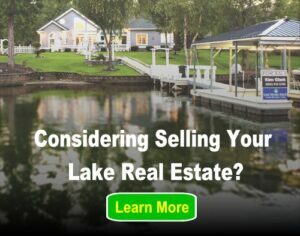 Such combinations will help create a stark and compelling new look to your lake home, as well as yield as much as 43 percent return on investment. Uniformity has its place, but not in 2019. When you’re working with metals, Invaluable.com advises homeowners to mix no more than three metals in a room, and to choose one dominant material and one to two accents. 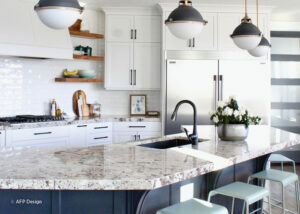 Aluminum is a cool-toned metal that works well as a room’s dominant material and is often seen in kitchens, particularly those with stainless-steel appliances. Copper and gold make the best accents to use with silver. If you want your kitchen to feel warm, incorporate gold and copper in drawer pulls and cabinet handles, lighting fixtures and counter-top baubles. Or keep your kitchen cool with cast iron fixtures. Replacing these small details can have an almost 90 percent return on investment, according to USA Today. Also consider using textured metal finishes. For example, if your kitchen appliances are stainless steel and you choose copper as your accent color, swap your coasters with hammer-finished copper ones or replace your backsplash with hammered, bronze sheets. Simply living at the lake can help reduce your stress thanks to the “blue mind effect,” which is responsible for the feelings of relaxation and peace people experience near the lake. But spa-style landscaping, which is expected to become an emerging trend in 2019, can take these feelings to the next level. Enhance your shore appeal with a small zen garden under a big pergola. Enclose the area with warm-toned wooden benches and airy drapes, or feature a quiet, miniature reflection pond or tricking waterfall wall. For something simpler, landscape with aromatic plants along your waterline or retaining wall, such as rosemary or lemongrass. Gardenias, jasmine and lavender are also calm-inducing plants to include in your landscaping. These flowers fare poorly in consistently moist soils, so try planting them closer to your home than the water. And be sure to include some stabilizing vegetation too to protect your shoreline, like blue flag irises, lemongrass and cardinal flowers. In fact, USA Today also reports these small upgrades can more than double your money in resale value.